There are several reasons that these dispatches have become less frequent. For one, some of the pairings have become routine and feel less newsworthy as a result. Some of the good ones get lost in the writing workload that I have (definitely a good problem) and then other times, I’ve worked so many extra hours at the store, Westside Market East Village that the last thing I want to do when I get home is write about my retail endeavors. The extra hours owe to the nifty coincidence of the busy season starting just as a new stock clerk gets settled in. The new guy is more conscientious than his predecessor but English isn’t his first language and he is still learning to parse the difference between the nine types of Lagunitas and eight varieties of Founders we carry. Asking him to grasp the six varieties of Stillwater or five of Maine Beer Company….yeah, that falls on my shoulders these days. Anyway, Friday is a night I usually look forward to meeting the public with samples of beer and cheese. People are usually receptive and chatty. This Friday was tougher though. It was the first rainy and cold day of the autumn and on top of that the weather forecasts warned of a hurricane. New Yorkers used to shrug off hurricane forecasts, but Sandy, three years ago knocked the city in general and downtown Manhattan for a loop. Power was out in many areas for weeks, and everywhere for days. So I decided not to take any big risks. When my colleague on the cheese counter suggested I use up some Midnight Moon that he was going to trim, I was thrilled. 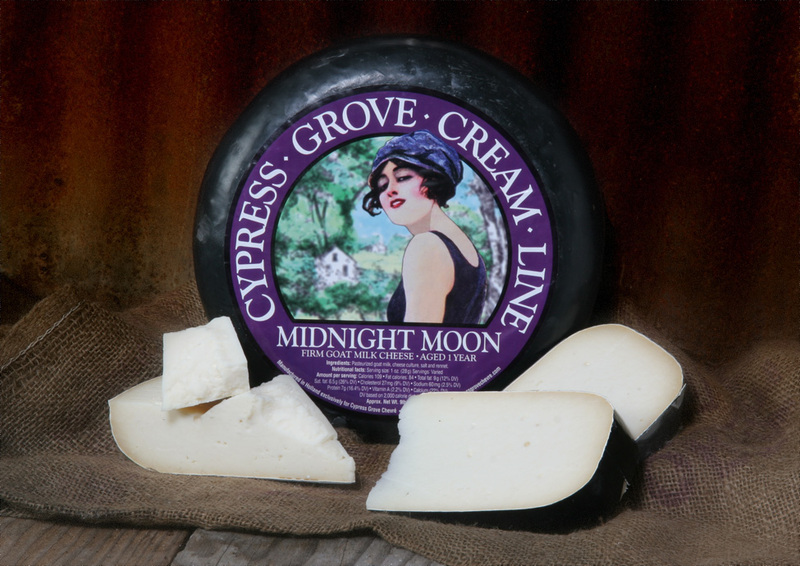 Midnight Moon is an aged goat gouda from Holland via California and it has a smooth delivery and gentle sweetness that makes it an instant crowd pleaser. Aged Goudas with their sweet overtones and salty finish in general pair well with India Pale Ales and we are having a Double IPA moment. The clientele went crazy for the Grimm’s After Image and before that the Pipeworks Ninja v. Unicorn. We just got the Westbrook Citrus Ninja Exchange and those bottles are moving briskly, perhaps the best selling big bottle right now. I’m hoping to have a dedicated NYC section by the first of the year. Yeah, everyone has Sixpoint and Brooklyn, but I want to anchor a sales area around the work of the new Gotham breweries like Singlecut, Finback and Other Half. We have two Singlecut bottles, Does Anyone Remember Laughter, an excellent IPA full of orange zest and smoky overtones and a new one, TNT Bon Bon, a Double IPA. I chose the latter to pair. It has a grapefruity finish that I figured would contrast nicely with the Midnight Moon’s smoothness. It did, and people either gravitated toward one or the other. It brought people out of their shell for a minute (“damn that’s good, can you show me where that is” was a common response to the items), which is all you can ask for from people with hurricanes on their mind. This entry was posted in beer, cheese, culinary, food, foodie and tagged beer, cheese, eastvillage, Fromage, india pale ale, nyc. Bookmark the permalink.